For a deeper shawl collar, see here and here. 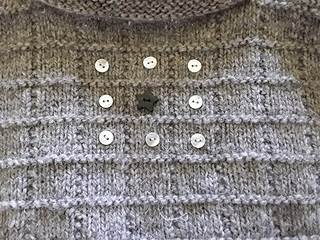 The latter is a new, detailed explanation of how to make a deeper shawl collar with instructions specific to Buttonbox. 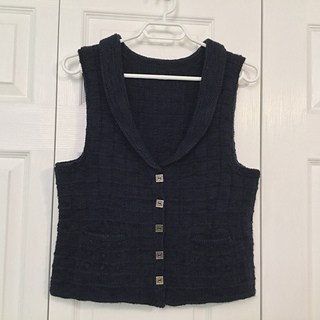 The pattern stitch for this vest, with its little boxes, is an adaptation of the traditional Gansey stitch, “Grampian Steps”, consisting of eight rows, five of which are in just plain knitting. It reminded me of my button box, with all its little compartments calling out to be filled with treasures. 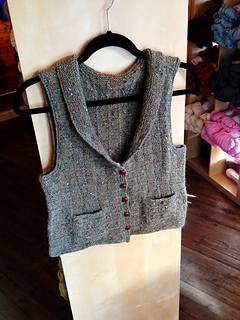 In this case, I answered the call with small French knots, adding subtle texture to the pockets and upper back. I’ve always loved knits with small details that only fully reveal themselves close up. You might want to substitute beads, embroidery, or even special buttons. This is a useful layering piece with flattering waist shaping and a feminine shawl collar knitted on in short rows (no tidying up of wraps required because it’s in garter stitch). Because it’s also seamless, you’ll only need to pick up a sewing needle to tack down the pocket linings and weave in the ends. 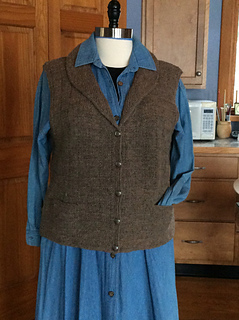 The model worn here is knitted in Brooklyn Tweed’s Shelter; I made the prototype in Blue-faced Leicester spun and plied with a drop spindle to produce a 2-ply worsted weight yarn. Row 1 (RS): K1, patt 18 (23, 27, 32, 36, 40), pm, patt 17, pm, patt 18 (23, 27, 32, 36, 40), k1. Row 2: P1, patt 18 (23, 27, 32, 36, 40), sl marker, patt 17, sl marker, patt 18 (23, 27, 32, 36, 40), p1.